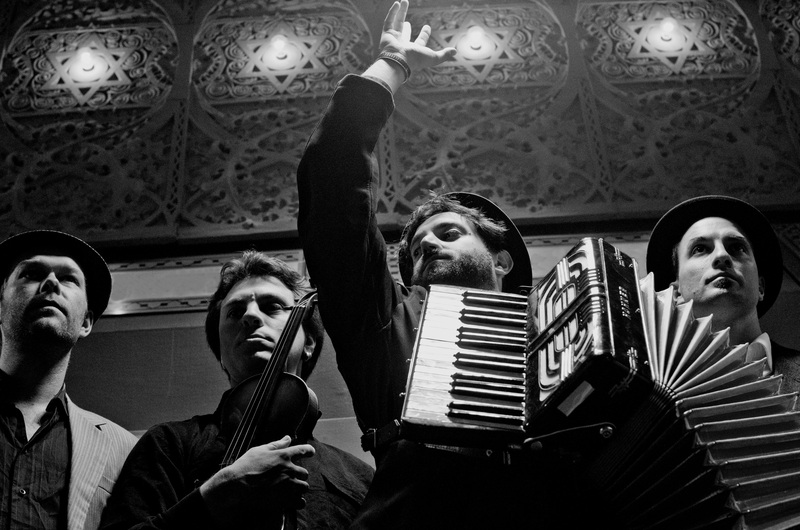 Musicians Craig Judelman, Mark Kovnatskiy, Mitia Khramtsov, and Ilya Shneyveys at the Shtetl Neukoelln Festival. Photo by Shendl Copitman. 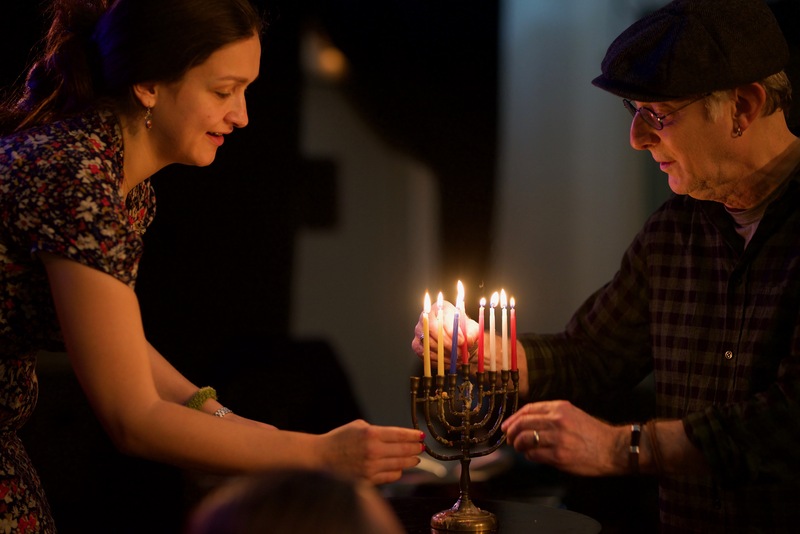 The third annual festival of Yiddish culture and music Shtetl Neukoelln, held on December 5-9, 2018 in Berlin, warmed and illuminated the dark and grey winter in the German capital. 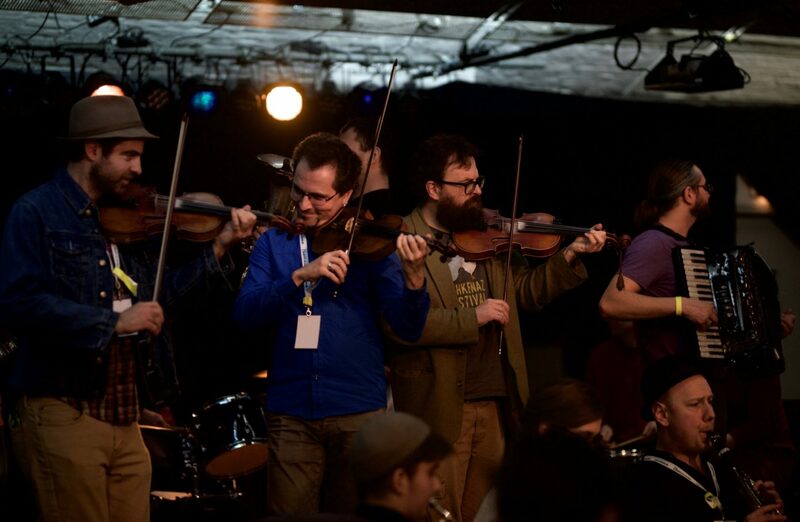 Five days of concerts, workshops and jam sessions demonstrated the variety – both of genre and geographical – of contemporary klezmer music and Yiddish songs. 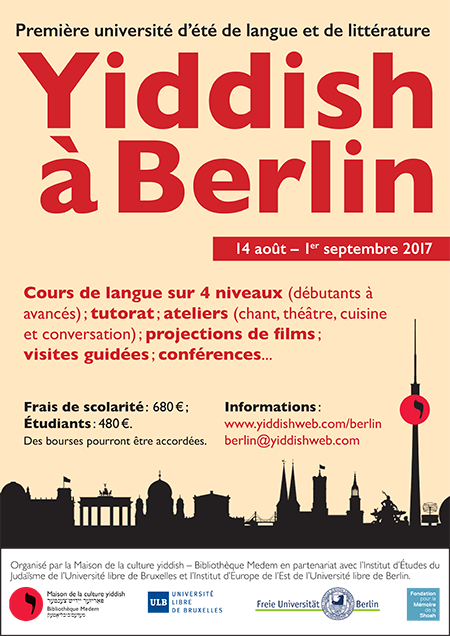 Even more significantly, the interest aroused by the festival, the number of people who came to the events (each was sold out even though the festival was not widely publicized) and the enthusiasm of the workshops participants demonstrated that Yiddish culture in Berlin is not a museum artifact, it is live and proliferating. 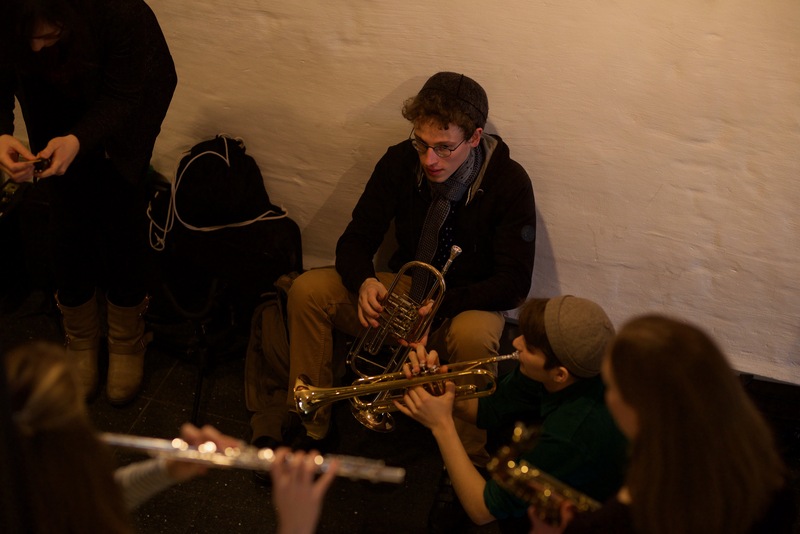 The festival was founded in 2016 by a group of klezmer musicians and singers, most of them immigrants from other European countries, who gathered in the Oblomov bar in Neukoelln (one of the central districts of Berlin). Jam sessions organized by accordionist Ilya Shneyveys (LV), clarinetist Emil Goldschmidt (DK), and drummer Hampus Melin (SE) attracted (and continue to attract) many listeners, and the artists sought to expand from there. Thanks to initiative by Sasha Lurje (LV) and Daniel Kahn (USA/DE) dance-balls and bigger concerts appeared. One of the heads of the Oriente music label Till Schuman created an association supporting the artistic endeavors. Through all this, it became clear that Berlin could support and needed its own klezmer festival. In collaboration with Berlin culture center and concert hall Werkstatt der Kulturen (Workshop of Cultures) the project was launched. “It was an absolutely natural thing for us to create the festival, because our events aroused so much interest, and we wanted more people to have access to this music and culture. There is a really cool klezmer community of artists in Berlin who, because of different reasons, almost never play in the city! We wanted to give them also the stage here so the locals could enjoy their music. Besides that, we wanted Yiddish to have its well-deserved place on the multinational map of Berlin. The primary value for us as organizers is accessibility (both cultural and financial). Our festival has to be a cozy event. We don’t want people to feel obliged to commit to some large-scale happening; that’s why we have a lot of open sessions and free concerts, so people can join whenever they want. The demography is very broad: we have audiences of different ages, nationalities, and beliefs. We don’t have any specific target group, everyone is welcome! 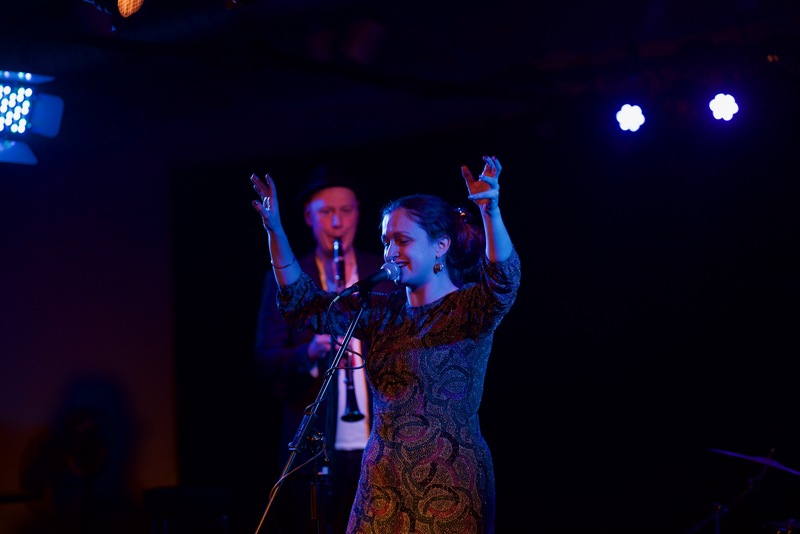 In 2018 Shtetl Neukoelln lasted for five days, starting with a gala-opening in the Jewish museum in Berlin and ending with a big and loud jam session. Among the bands and singers were world-renowned legend of klezmer revival Michael Alpert (USA/UK) who together with baladeer Daniel Kahn (USA/DE) traded Yiddish blues and bard songs in an intimate performance they titled “Arum dem fayer.” Russian balkan-klezmer band Dobranotch, famous for their Yiddish cover of a song by the German band Rammstein, rocked the venue. The audience was on their feet dancing from the first sounds of music. International band Forshpil (RU/DE/LV) with its singer Sasha Lurje performed psychedelic rock in Yiddish, which was a great surprise to those who did not expect such experiments with klezmer. Sound and visual project Torah Images created by Moldavian photographer Shendl Kopitman and violinist Mark Kovnatskiy (DE) presented a new view of Biblical history. Michael Winograd (USA) entertained the audience on the last day of the festival with his virtuosic clarinet performance. In addition to concerts, the program included a unique public reading of new and yet unpublished German translations by Berlin artist and Yiddish activist Arndt Beck of Avrom Sutzkever’s diary and his poems about Berlin. The poet visited Germany in 1946 to participate in the Nuremberg trials and wrote about his impressions. The translator explained that although one could see a certain symbolism in reading Sutzkever’s poems about post-war Berlin in Berlin today, he does not want to emphasize or reify national histories: “German or not, we should build a new anti-national Yiddish culture of equality in Berlin and incorporate its history. For us. The ground here is quite good, and the festival is a first fixed star,” says Arndt. Indeed, Berlin today is the most multinational city in Germany, where people from different origins successfully coexist. It is a cosmopolitan capital, where Yiddish culture can take its honoured place among other cultures. This year the program included a workshop by actor and cabaretist Shane Baker who read Yiddish poetry and introduced traditions of Yiddish cabaret to the participants. For the next festival the organizers are planning to include more events about Yiddish literature, language, and theater, and to make them an integral part of the event alongside klezmer music, Yiddish song, and dance. Next year’s festival will be called Shtetl Berlin, and together with the upcoming second Yiddish summer school these events have the potential to remake Berlin again into one of the most important spots on the map of Yiddishland. The festival demonstrated that klezmer is definitely not dead, that Yiddish unites people from completely different backgrounds, and that Yiddish culture in Berlin has not only a past, but also a future. Kuznetsova, Ekaterina. “The Shtetl Neukoelln Festival Brings Yiddishland to Berlin.” In geveb, January 2019: https://ingeveb.org/blog/the-shtetl-neukoelln-festival-brings-yiddishland-to-berlin. 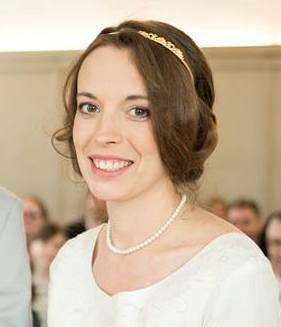 Kuznetsova, Ekaterina. 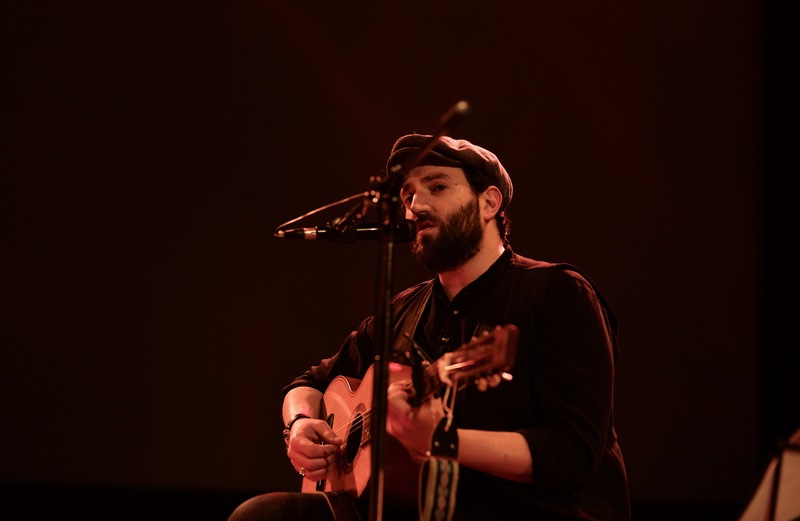 “The Shtetl Neukoelln Festival Brings Yiddishland to Berlin.” In geveb (January 2019): Accessed Apr 21, 2019.